We’re having quite the budding romance with floral-motif jewels this spring. The fine jewelry houses are delivering some stellar interpretations of nature through the fabrication of so-real-you-can-smell them orchid brooches and garden-worthy collars, bedecked in jewels and gemstones that almost perfectly mimic their natural colors. 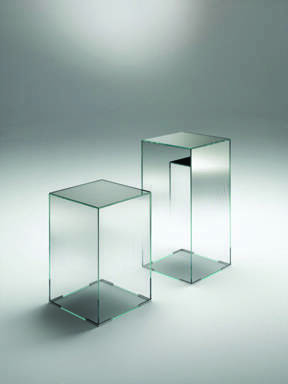 Might we suggest indulging in one jewel for each kind of bud; before you know it you’ll have your own garden—no green thumb needed, just emeralds. Sapphire and diamond flower brooch, price upon request; available at Van Cleef and Arpels boutiques, 9700 Collins Ave., Suite 129, Bal Harbour, FL 305-866-0899; and 744 Fifth Ave., New York, NY 212-644-9500. Necklace, from Bulgari’s high jewelry collection in 18k yellow gold with peridots, sapphires, garnets and diamonds, price upon request; available at Bvlgari boutiques, 9700 Collins Ave., Suite 118, Bal Harbour, FL 305-861-8898; and 730 Fifth Ave., New York, NY 212-315-9000. 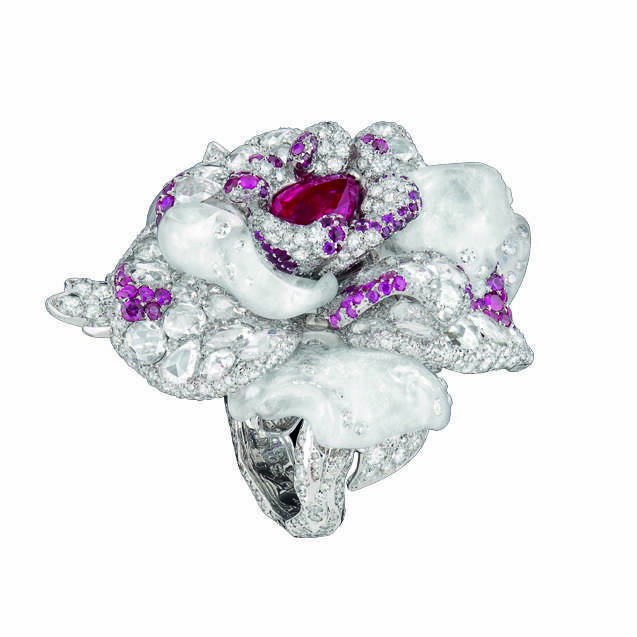 Caresse d’Orchidées par Cartier brooch in platinum with amethyst, garnets and briolette-cut diamonds, price upon request; available at Cartier boutiques, 3930 Northeast 2nd Ave., Miami, FL 305-864-8793; and 653 Fifth Ave., New York, NY 212-753-0111. Diamond Gardenia brooch, price upon request; available at Martin Katz boutiques, 437 Madison Ave., New York, NY 212-957-8285. Mid-summer night flower diamond cuff bracelet featuring 51.41 total carat weight in 18k black plated gold, price upon request; available at Jacob and Co. boutiques, 48 East 57th Street, New York, NY 212-719-5887. 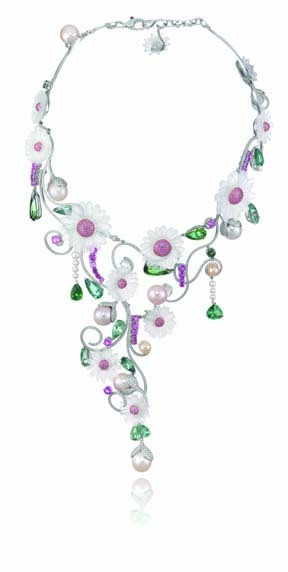 Vine necklace from the red carpet collection by Chopard, price upon request; available at Chopard boutiques, 9700 Collins Ave., Suite 127, Bal Harbour, FL 305-868-8626; and 709 Madison Ave., New York, NY 212-223-2304. Orchid ring in diamonds and rubies, price upon request; available at Saks Fifth Avenue in Bal Harbour Shops, 9700 Collins Ave., Bal Harbour, FL 305-864-3263; and Christian Dior boutiques, 21 East 57 St., NewYork, NY 212-931-2950. 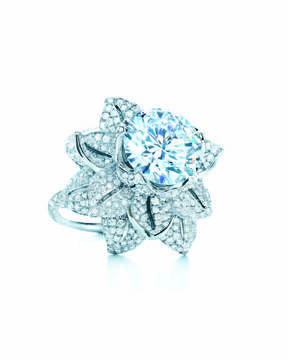 Tiffany diamond flower ring in platinum, $875,000; available at Tiffany and Co. boutiques, 9700 Collins Ave., Bal Harbour, FL 305-864-1801; and Fifth Ave., and 57th St. New York, NY 212-755-8000.